11:1 Now Jephthah the Gileadite was a mighty warrior, but he was the son of a prostitute. Gilead was the father of Jephthah. 2 And Gilead's wife also bore him sons. And when his wife's sons grew up, they drove Jephthah out and said to him, “You shall not have an inheritance in our father's house, for you are the son of another woman.” 3 Then Jephthah fled from his brothers and lived in the land of Tob, and worthless fellows collected around Jephthah and went out with him. 1Now Jephthah the Gileadite was a mighty man of valour, and he was the son of an harlot: and Gilead begat Jephthah.2And Gilead's wife bare him sons; and his wife's sons grew up, and they thrust out Jephthah, and said unto him, Thou shalt not inherit in our father's house; for thou art the son of a strange woman.3Then Jephthah fled from his brethren, and dwelt in the land of Tob: and there were gathered vain men to Jephthah, and went out with him.4And it came to pass in process of time, that the children of Ammon made war against Israel.5And it was so, that when the children of Ammon made war against Israel, the elders of Gilead went to fetch Jephthah out of the land of Tob:6And they said unto Jephthah, Come, and be our captain, that we may fight with the children of Ammon.7And Jephthah said unto the elders of Gilead, Did not ye hate me, and expel me out of my father's house? and why are ye come unto me now when ye are in distress?8And the elders of Gilead said unto Jephthah, Therefore we turn again to thee now, that thou mayest go with us, and fight against the children of Ammon, and be our head over all the inhabitants of Gilead.9And Jephthah said unto the elders of Gilead, If ye bring me home again to fight against the children of Ammon, and the LORD deliver them before me, shall I be your head?10And the elders of Gilead said unto Jephthah, The LORD be witness between us, if we do not so according to thy words.11Then Jephthah went with the elders of Gilead, and the people made him head and captain over them: and Jephthah uttered all his words before the LORD in Mizpeh.12And Jephthah sent messengers unto the king of the children of Ammon, saying, What hast thou to do with me, that thou art come against me to fight in my land?13And the king of the children of Ammon answered unto the messengers of Jephthah, Because Israel took away my land, when they came up out of Egypt, from Arnon even unto Jabbok, and unto Jordan: now therefore restore those lands again peaceably.14And Jephthah sent messengers again unto the king of the children of Ammon:15And said unto him, Thus saith Jephthah, Israel took not away the land of Moab, nor the land of the children of Ammon:16But when Israel came up from Egypt, and walked through the wilderness unto the Red sea, and came to Kadesh;17Then Israel sent messengers unto the king of Edom, saying, Let me, I pray thee, pass through thy land: but the king of Edom would not hearken thereto. And in like manner they sent unto the king of Moab: but he would not consent: and Israel abode in Kadesh.18Then they went along through the wilderness, and compassed the land of Edom, and the land of Moab, and came by the east side of the land of Moab, and pitched on the other side of Arnon, but came not within the border of Moab: for Arnon was the border of Moab.19And Israel sent messengers unto Sihon king of the Amorites, the king of Heshbon; and Israel said unto him, Let us pass, we pray thee, through thy land into my place.20But Sihon trusted not Israel to pass through his coast: but Sihon gathered all his people together, and pitched in Jahaz, and fought against Israel.21And the LORD God of Israel delivered Sihon and all his people into the hand of Israel, and they smote them: so Israel possessed all the land of the Amorites, the inhabitants of that country.22And they possessed all the coasts of the Amorites, from Arnon even unto Jabbok, and from the wilderness even unto Jordan.23So now the LORD God of Israel hath dispossessed the Amorites from before his people Israel, and shouldest thou possess it?24Wilt not thou possess that which Chemosh thy god giveth thee to possess? So whomsoever the LORD our God shall drive out from before us, them will we possess.25And now art thou any thing better than Balak the son of Zippor, king of Moab? did he ever strive against Israel, or did he ever fight against them,26While Israel dwelt in Heshbon and her towns, and in Aroer and her towns, and in all the cities that be along by the coasts of Arnon, three hundred years? why therefore did ye not recover them within that time?27Wherefore I have not sinned against thee, but thou doest me wrong to war against me: the LORD the Judge be judge this day between the children of Israel and the children of Ammon.28Howbeit the king of the children of Ammon hearkened not unto the words of Jephthah which he sent him. Why was Jephthah in the land of Tob? How did Jephthah become ruler over Gilead? 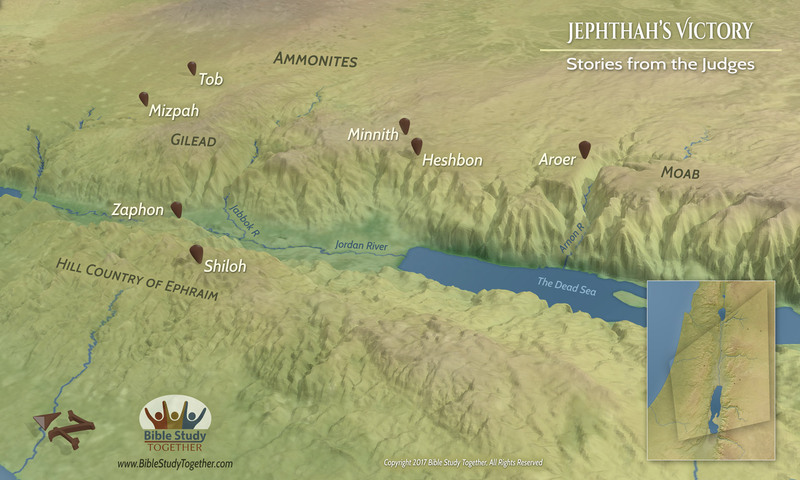 What was Jephthah’s response to the Ammonites claim on the Israelite’s land? How can you recognize the value of a specific person that you know who has been rejected? Befriend someone who is an outcast.